To all those retards claiming that video games make you violent I fear you have finally gotten the proof you need. A new game has been spotted across Japan recently one that has tea tables worldwide cowering in fear at the mention of its name – Chabudai Gaeshi. 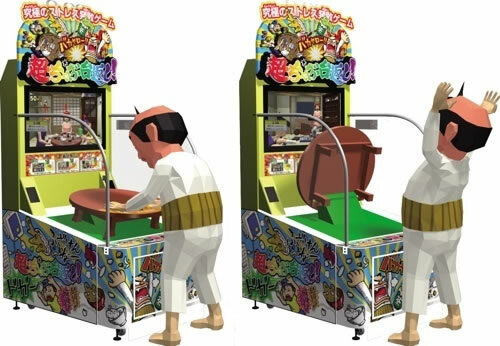 Japanese arcade game Cho Chabudai Gaeshi is a score attack game that lets players pound a soft table for combos and then upend it for the finishing move. Settings include a host club, a wedding party, an office and a Japanese style living room. So for example, in the living room stage, players bang on the table as their family complains more and more and finally flips over the table. The video below demonstrates the game and why the troubled individual who has the unbeatable high score in this game is not somebody you’d want to piss off. I don’t know that this would make its players violent – it’s funny, but in a way it might make some people stop and think about what they are doing. Wow, that guy playing looks remarkably bored. Maybe it’s just me, lol.. When he looked at his watch it made me laugh.